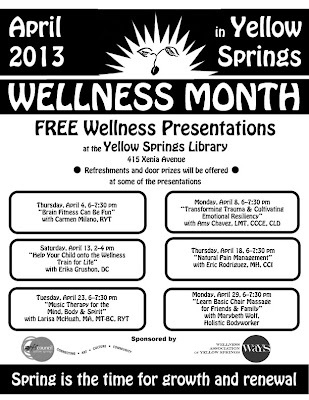 The Wellness Association of Yellow Springs (WAYS), the Yellow Springs Community Library and the Yellow Springs Arts Council (YSAC) are collaborating on the first annual “April is Wellness Month" in Yellow Springs. Additionally, on Thursday, April 25, an OM Circle will be held at 7:30pm in the Yellow Springs Presbyterian Church Fellowship Hall. The event will bring people together to chant OM for 45 minutes. OM is referred to as “the sound of the universe” and is said to have healing effects on those who chant it as well as on the community at large. All are invited to join the circle. Event leaders are Deborah McGee, Polarity Therapist and Energetic Bodyworker, and Douglas Klappich, Reflexologist and Ayurvedic Practitioner. 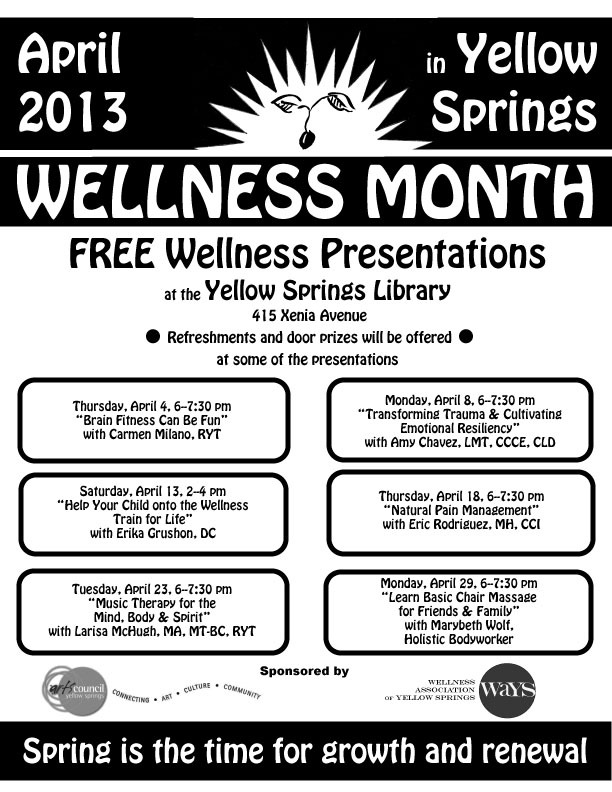 Plans for 2014 include adding a Health and Wellness Fair to kick off the month-long event. Watch here for the announcment of our Facebook page full of events once it is launched.